It’s hard to know where to begin with Devil’s Third. As the first game from legendary Japanese game designer Tomonobu Itagaki since his sudden departure from Tecmo in 2008, the Dead or Alive creator would soon rally former Team Ninja developers when they similarly chose to step away from a company that they had long felt betrayed by. Forming Valhalla Game Studios, this first project was initially backed by THQ and had been destined for PlayStation 3 and Xbox 360. 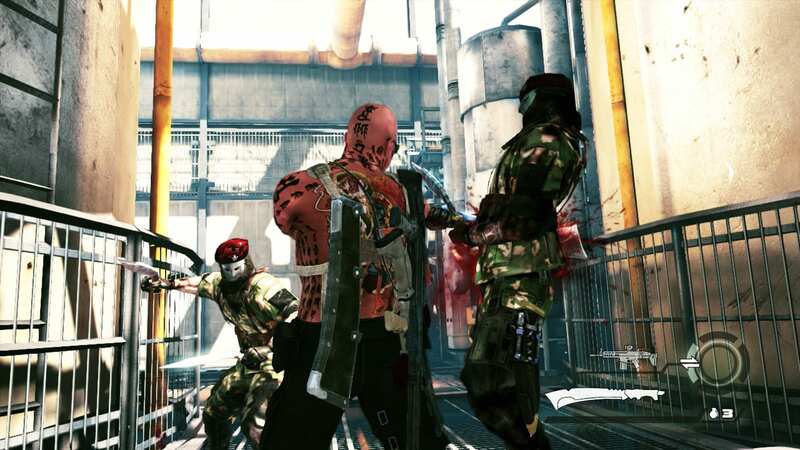 But when the publisher’s closure was announced in 2013, Devil’s Third’s future was cast into uncertainty despite Itagaki retaining the intellectual property rights. Nintendo unexpectedly became the white knight, revealing at E3 2014 that they had stepped in to publish Itagaki’s creation as a Wii U exclusive. Another push to lure a more mature audience, Devil’s Third inevitably helps to diversify the console’s game catalogue. But, enough of a history lesson as, for a visionary that had once helped to revive Ninja Gaiden from dormancy, Devil’s Third feels more like a complete creative regression. We play as prisoner UR-713, Ivan, who was sentenced to 850 years imprisonment on a charge of terrorism. The ex-mercenary is soon released from his captivity when the world’s satellites and electrical weaponry are wiped out by a shadowy terrorist group that he had once worked with. With the government wishing to leverage his knowledge of his former comrades, Ivan is left to battle anyone that stands in his way while seeking his own personal redemption. Such story is largely passable, even if it ultimately never truly thrills or endears. But the game’s more significant troubles lie in other areas. Itagaki’s flair for stylised combat is entirely absent, despite players being equipped with a three-weapon loadout that sees you pluck choices from primary, secondary and melee categories. These respectively see you choosing between assault rifles and sniper rifles, pistols and explosives, and weapons with more brutal animations such as a katana, machete, tomahawk and fireman’s axe. It is this blend of modern military weaponry and close quarters combat that presents the game’s more unique draw, players picking off from a distance – a headshot delightfully tearing your attacker’s head clean from their shoulders – before moving in to slice away at any survivors. But, neither are implemented with any proficiency. Devil’s Third stays true to Itagaki’s long-held design philosophy in creating games that thrive on the simplicity of their button inputs. But while Ninja Gaiden had layered the gameplay experience with multiple button combinations, here we’re merely reduced to fast and heavy attacks that repeat the same animations over and over again. It’s dull. There’s a rather overpowered leaping Aim-lock attack that can see you recklessly bound toward an enemy and neutralise them in a single downward slash, but Devil’s Third relies on you to be switching weapons throughout for variance. Melee combat is encouraged, though. As you damage enemies your Enbaku Gauge fills and, once activated, caused the tattoos across Ivan’s body to light up. Enemies aren’t mystified by such visual trickery, but Ivan will temporarily take less damage with his speed and strength improved. The only challenging moments that I have so far faced in Devil’s Third are the boss encounters. These unimaginative and overpowered bullet sponges have been a test of patience more than anything, which certainly came as a surprise considering the studio’s pedigree from their time at Team Ninja. Beyond tackling the story, players are invited to tackle missions in a separate Score Attack mode. Racing against the clock and trying to rack up as many points is a welcome addition for those that wish to take up such challenge, with Global, Monthly, Weekly and Personal Best ranking systems in place to compare your skills with others. Devil’s Third more immediately obvious flaw is that it looks like an early Xbox 360 release, reminiscent of a time when the industry was getting to grips with high-definition development. Itagaki is renowned for being vocal, once taking to Facebook to respond to a sub-HD screencap from the game’s E3 2014 trailer. Except, it’s not. Nothing has drastically changed from what we saw last year. What we’re instead left with is a complete game marred by an inconsistent frame rate and disparity between character models. Even environmental effects such as explosions and falling rubble remind me of the GameCube era. Itagaki added that the “HUD’s UI was changed” as well as the button layout, but I’m clearly missing something as they look exactly the same to me. Those comments were made last November, making me wonder whether certain elements have been reverted back in a blind panic. Perhaps this is all indicative of the well-documented woes that have been faced in development. When the company making the original game engine for Devil’s Third was closed, Itagaki’s team switched to an adaptation of Relic Entertainment’s engine, and then the Darksiders II engine before eventually resorting to Unreal Engine 3. Whatever has happened behind closed doors, the end result sees Devil’s Third shaping up to be a disconcertingly inconsistent experience. But, it is how glaringly outdated Itagaki’s vision has been this time around that I share the most concern about. Looking at the gameplay above, it looks pretty good. Which makes me question the entire article. You claim it looks like early xbox360 games, late 360 games didnt look that good. Im excited about the game, after watching the mission one gameplay above im more excited. Cant wait to play this one! Wow… Watched the gameplay… Audio is out of sync. Video, effects and textures look grainy/muddy. Bad voiceing. And the style appears quite dated. Looks like a game that’s been developed by someone that’s out of touch with the current generation of expectations with games quality. But hey at least it’s not another remake of a game that’s already been done before on Nintendo’s platform so I’ll give them props for that. Nintendo needs more big budget games that aren’t another yoshi/mario/kirby/whatever rehash to really draw more people to it’s consoles. That’s their problem really they have a few really good IP’s but they use them way to much and as a result they have become stale. Gotta diversify. Which is why I play PS4 and not WiiU. Not enough diversity. Also I don’t like the wavey stick controller. No offense.